The Brooklyn Nets have proven themselves as one of the grittiest teams in this league. 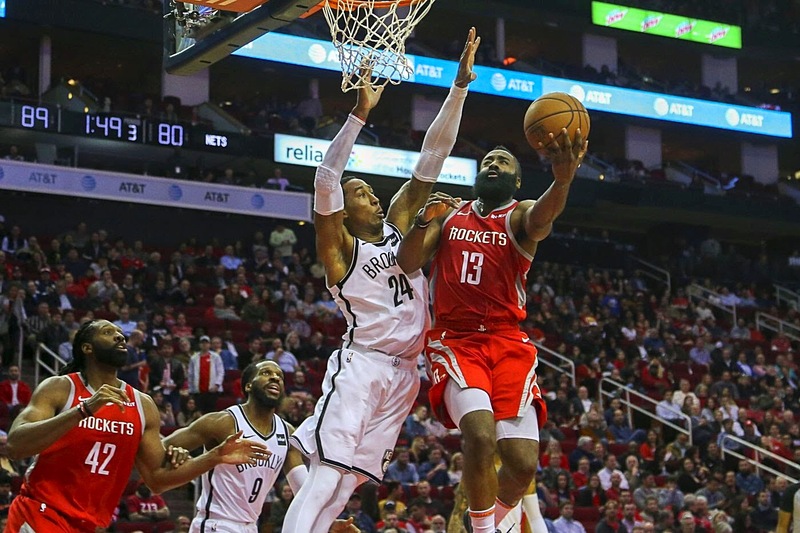 Tonight, against the Houston Rockets they proved just how gritty they are; as Brooklyn stuns the Rockets in an overtime win, 145-142 that ended with an overjoyed Brooklyn team running onto Houston’s court, greeting their teammates with joy; they did it. The Nets who look to move up the Eastern Conference standings would take on James Harden and the Houston Rockets. Harden has been putting on stunning performances, and has just passed Kobe Bryant for most consecutive 30-point games. Tonight would prove no different; the Nets remained composed through each quarter. They came out excited and aware as they gained a 15-point lead (34-19) down the stretch, but Houston would cut that lead to 4 as they entered the 2nd quarter. As Houston trailed by 8 at the close of the first half, they looked to take the lead and control of the game. They outscored the Nets by 17 in the 3rd quarter, as James Harden brought the Rockets close to a win. The Nets would answer back with a run of their own; they put up 46 points in the 4th quarter, as they took the game to overtime. Spencer Dinwiddie would score 25 of his 33 points in the 4th and overtime. He led the Nets down the stretch, and sealed the win for the Nets as they stun the Rockets in a victorious win. Harden Does it Again– James Harden scored 58 points tonight, while going to the line 23 times. This is his 2nd season high, but it would be enough to hold off the Pesky Nets. Dinwiddie Forces Overtime– Spencer Dinwiddie was spectacular. He finished with 33 points and 10 assists. After leading the Nets to this overtime victory, he continues to show his importance and necessity to this team. Double Double for the Fro– Jarrett Allen put up a double double, and made a key play down the stretch of overtime to seal the win for the Nets. He finished with 20 points and 24 rebounds. 7 Players in Double Figures– 7 of the Nets players, including all starters, put up double digits in the stunning victory. 70 3’s?– The Houston Rockets broke their own record, taking an astonishing 70 3-pointers, but only making 23 of them. The Nets continue to show their heart, their growth, and their perseverance. They are now 6th in the East, and they look to maintain their spot as the playoffs approach.